When summer rolls in around here we dust off the grill and fill the propane tank. As a newly converted gas griller, I freely admit that I love the ability to make a last-minute decision to cook al fresco—no coals and no wood. Some would call this travesty, and many would cringe at calling it barbecue, so I’ll stick with the term “grilling” and, yes, I do it with pride. I make a mean rib, juicy salmon and killer skirt steak but one thing that’s taken me a while to get right is succulent grilled shrimp. 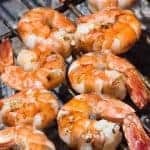 The high heat of a grill needs lots of babysitting to ensure it doesn’t overcook shrimp the minute they hit the grates. We’ve all eaten them dried out—unappealing in every way. I was bound and determined to figure this out. It starts with great shrimp, or prawns if you like. I prefer a U16–20, meaning one pound consists of 16 to 20 shrimp. These are just 2–3 bites each, and big enough to handle a few minutes on the grill. Any smaller and it’s really tough to control the cooking time. I peel and devein myself, looking for wild shrimp whenever possible. Thirty minutes before the shrimp are going to cook I drop them in a very simple brine. The brine can be made ahead of time, too, always an added bonus in my book. Longer is not better here—shrimp are tender and too much time in the salted water solution will actually destroy the texture of the flesh. Once brined, I toss the shrimp in garlic oil and thread them on skewers flanked with bits of onion. How you thread them is important. I put the skewer through both the tail and head end of the shrimp so it forms a “C” on the skewer-this is more stable, and allows you to nestle the shrimp in tightly so they insulate themselves from cooking too quickly. The other nice thing about a gas grill is heat regulation. I get mine hot then turn the heat down to medium. I put on the shrimp skewers, shut the grill and give it 2–3 minutes, just until the shrimp turn pink on the underside. Flip the skewers over and in 1–2 minutes more you’ll have pink shrimp that are just opaque in the center. 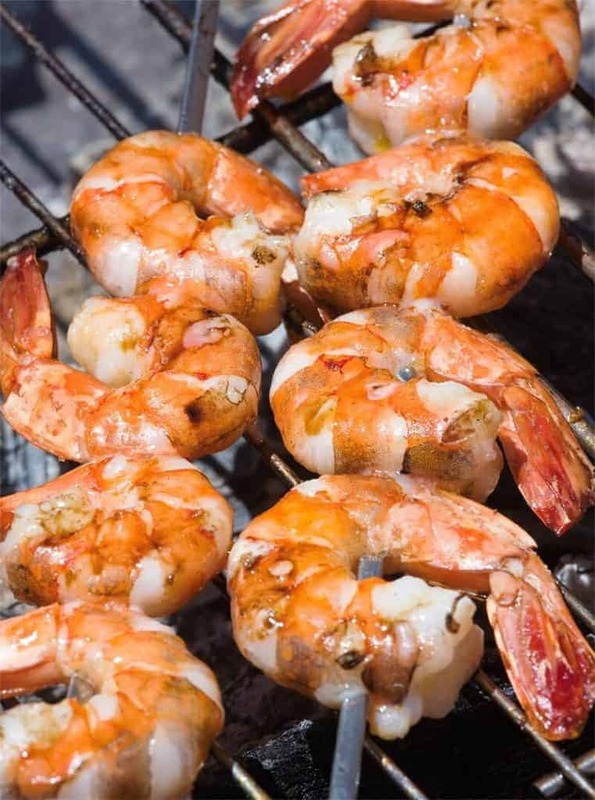 A minute or two of carryover cooking between the grill and the plate and you’ll be rewarded with juicy, plump shrimp that go down mighty easy. It’s worth cooking a lot of these. Piling them on a big platter with grilled bread and a drizzle of fresh salsa verde makes for a perfect summer meal and the leftovers can top a salad or fill a sandwich the next day. No time to make salsa verde? No worries—grilled shrimp are also great with tons of lemon wedges, grilled peaches, fresh pico de gallo or a simple vinaigrette. To prepare the brine, bring the water, lemon, salt and sugar to a boil in a medium saucepan and cook just until salt and sugar dissolve, 3–4 minutes. Remove the pan from the heat and add about 2 cups of ice to cool it down. Set aside until ready to use. Brine keeps well, covered and refrigerated, for 2–3 days. To prepare the salsa verde, roughly chop the parsley, mint and garlic. Place in the bowl of a food processor along with the lemon zest, lemon juice, anchovy and capers. Blend until well combined; then, with the motor running, drizzle in just enough olive oil to create a glossy sauce, similar in consistency to pesto. Transfer to a bowl and season as needed with salt, pepper and additional lemon. Sauce keeps well, covered and refrigerated, for 2–3 days. Place the shrimp in a bowl with the brine, cover and refrigerate for 30 minutes. Drain shrimp well and pat them dry, discarding the brine. In a small sauté pan, combine the oil and garlic and heat over medium-high heat. When small bubbles begin to form on the surface of the oil, reduce the heat to very low and cook for 20 minutes, until the oil is very fragrant. Strain the oil into a medium bowl to cool, reserving the garlic if desired. Add the shrimp to the cooled oil and toss well to coat. Sprinkle with salt and pepper. Using metal skewers, thread each one with 4 pieces of onion, 4 shrimp and 4 more pieces of onion. Be sure to skewer the shrimp through the tail and head ends, forming a “C” on the skewer. Shrimp and onions should have just a small amount of space between them. Heat a gas grill to medium heat. Place the shrimp skewers on the hot grill and cook covered until the underside is just pink, about 3 minutes. Turn shrimp over and cook until they are pink throughout and just opaque, 1–2 minutes more. Remove from the heat and let rest for a couple minutes before placing on a serving platter. Drizzle shrimp with salsa verde and, if desired, serve with grilled bread on the side. A note on purchasing shrimp: Look for wild shrimp, particularly from the Carolinas or the Gulf of Mexico. Note that most shrimp is frozen before it comes to market and this is actually okay here-fresh shrimp are so perishable it’s very rare to find them. You want shrimp that was caught sustainably, raised antibiotic free, and in healthy and clean conditions (not always the case with farmed shrimp).